Well-functioning capital markets start with deep pools of long-term capital. But despite some progress in recent years, pensions assets in the EU represent just 35% of GDP and are just one quarter as developed as in the US. Strip out the UK, and pensions assets in the EU27 are just 25% of GDP. At this dinner Gabriel Bernardino will discuss the challenge of developing a deeper pool of pensions assets in Europe, and in particular will focus on the recently launched PEPP initiative (pan-European personal pension products) that aims to encourage millions more people in the EU to invest in their pensions. For more information on PEPPs click here. Prior to his current role, Mr. Bernardino was the Director General of the Directorate for Development and Institutional Relations at the Instituto de Seguros de Portugal (ISP). 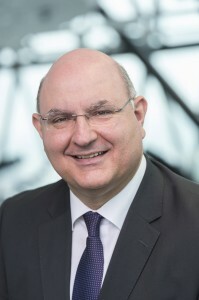 He has served in several positions of increasing responsibility since he joined the ISP in 1989 and represented EIOPA’s preceding organisation, CEIOPS, as Chairman between October 2009 and December 2010.